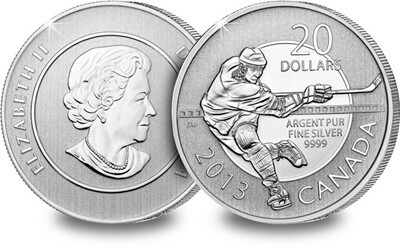 With its entire 250,000 worldwide edition limit now sold out, the Ice Hockey coin becomes the latest Royal Canadian Mint $20 silver coin to sell-out – securing the $20 coin as the world’s fastest-selling silver coin series. In just two years, the Canadian $20 silver coin series has caused an unprecedented collecting frenzy among collectors not just at home but worldwide with all seven coins selling out extremely fast. The first coin in the series featuring the Maple Leaf was issued in 2011 with a worldwide edition limit of 200,000 pieces. Just 29 days later, every single one had been sold. Surprisingly though, the Maple Leaf isn’t the fastest-selling coin in this series to date. To cope with the unprecedented level of demand following the Maple Leaf’s success, 250,000 coins of each of the next 5 issues were struck. But as the mintage increased, so too did demand, particularly among Canadians. Once they had one, they simply had to have the next. And the next and the next – leaving many collectors disappointed. 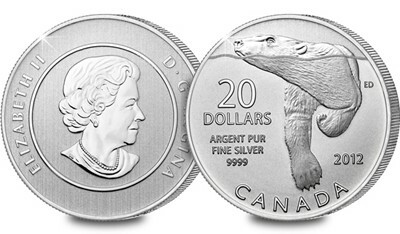 It was however the Polar Bear $20 silver coin that broke all previous records selling out in just 25 days – incredibly, that was 5 days faster than the celebrated 2012 Diamond Jubilee issue, which was comparatively slow at 30 days. Collectors haven’t had to wait too long to catch a glimpse of the next coin in the series. There’s every reason to assume all 250,000 of the new 2013 Canada Wolf Silver $20 Coin, the eighth of the series, will also sell out in double-quick time. Now officially sold out worldwide.